After a successful 5-2 homestand in the opening week of play, the Tampa Bay Rays will start a nine-game road trip on Friday. The first stop is San Francisco for a three-game Interleague set against the Giants. The Rays won both Opening Week series at home, taking three of four from Houston, and two of three from Colorado. 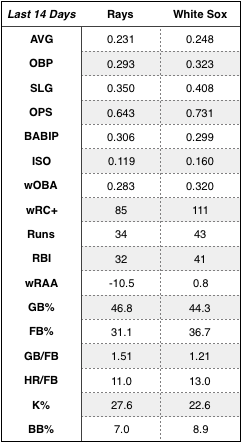 The common thread has been outstanding pitching from the starters, relivers, and bulk inning guys. Tampa Bay’s rotation has posted a 2.19 ERA/3.09 FIP across the first seven games while holding opponents to a .190 batting average. They have recorded 43 strikeouts in 37 innings before giving way to the ‘pen which has conceded only two runs in 28 innings of work. 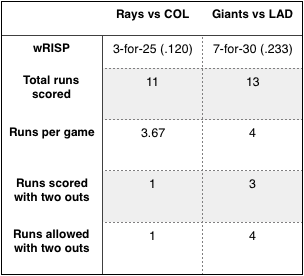 The Rays were denied a sweep of the Colorado Rockies after a 1-0, 11-inning loss Wednesday, in which they stranded 13 runners and went 0-for-10 wRISP. In spite of the 5-2 start, Tampa Bay is hitting only .182 in such situations. The Giants began Bruce Bochy’s final season inauspiciously, dropping three-of-four in San Diego and two of three to the Dodgers after a 5-3 loss Wednesday night. San Francisco’s rotation has posted a 2.68 ERA/4.36 FIP across the first seven games while holding opponents to a .221 batting average. They have recorded 35 strikeouts in 37 innings before giving way to the ‘pen which has conceded six earned runs in 21 innings of work. 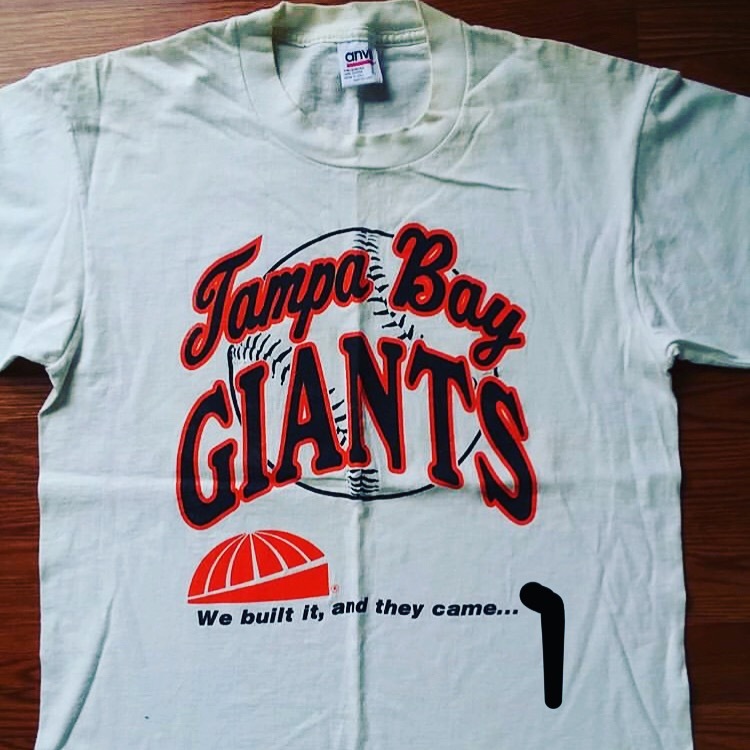 The last time the Rays faced the Giants, in 2015, they dropped all three ballgames, having been outscored 16-6. Kevin Cash is expected to lean on starter Tyler Glasnow (1-0, 1.80 ERA), and bulk inning guys Yonny Chirinos (1-0, 1.29 ERA), and Ryan Yarbrough (1-0, 2.08 ERA). Bruce Bochy is expected to respond with Dereck Rodriguez (1-0, 3.60 ERA), Jeff Samardzija (0-0, 0.00 ERA), and Drew Pomeranz (0-0, 3.60 ERA). Tyler Glasnow looked good in his first regular-season outing, tossing five innings of one-run ball while scattering six hits (including a home run by Alex Bregman into the 162 landing in left-field) and fanning four on 77 pitches (51 strikes, 66% strike rate). The right-hander’s fastball averaged 96.6 mph and hit 100.4 mph in the first at-bat of the game against George Springer. 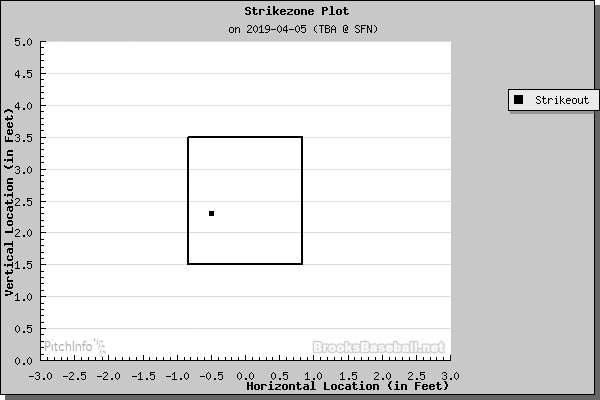 That particular at-bat resulted in a ground out on an 82 mph curveball on the inner third of the plate. Yet something was missing Saturday night. After working on a new delivery during Spring Training, one which included a pause, Glasnow decided to go back to his normal delivery, which served him well. I was kind of thinking about it throughout the week, and it was kind of one of those things, game day, just go out and compete. Today it just felt better to not do it. Glasnow said the pause will be something he mixes in every now and then to mess with hitters’ timing, and he plans to continue with the more traditional delivery moving forward. Dereck Rodriguez allowed two runs on four hits over five innings in his season debut against San Diego on Saturday. The 26-year-old right-hander has never faced the Rays. 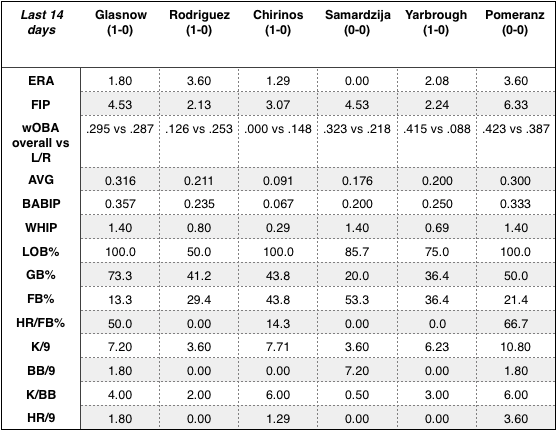 Rodriguez relies primarily on his 92 mph four-seam fastball with little arm-side movement, while also mixing in an 87 mph hard slider with little movement, a 91 mph sinker without much run or depth, an 85 mph changeup with a ton of backspin and some fade, and a whiffy 76 mph 12-6 curveball. Ryan Yarbrough allowed just one run across 4-1/3 innings of his 2019 debut. The southpaw gave up just three hits and a hit batsman while striking out three. Coming off a successful Opening Series, wherein the Rays took three-out-of-four from the Houston Astros, Tampa Bay welcomes the Colorado Rockies into Tropicana Field on Monday for a three-game series. The Rockies split their Opening series against the Marlins. 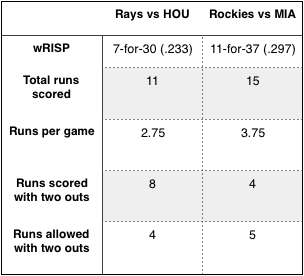 The Rays weren’t quite an offensive juggernaut against the Astros — scoring just 2.75 runs per game (on average). However, aside from Blake Snell, who allowed five runs on Opening Day, the pitching staff was phenomenal, giving the offense an opportunity to hold on to leads. Charlie Morton, Tyler Glasnow, and Yonny Chirinos — who took the mound from Friday through Sunday — limited Houston to four runs, while the bullpen gave up nothing across 14 relief innings. At the end of the day, the Rays pitching staff held the high-powered Houston offense to nine runs and a .213 average. 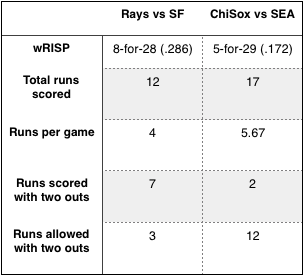 And while Tampa Bay’s offense didn’t quite charge out the gates, Rays hitters took advantage of the opportunities presented to them, scoring eight runs with two outs. Michael Perez, Tommy Pham, Yandy Diaz, Austin Meadows, Ji-Man Choi, and Guillermo Heredia have led that charge, combining for the 11 total RBI. Meanwhile, Colorado received bad news on Sunday, first baseman, Daniel Murphy, is headed to Injured List with a broken finger on his left hand. Murphy signed a two-year, $24-million free-agent contract with the Rockies in the offseason and is a career .299 hitter in 11 seasons. Even so, the Rays have injury concerns of their own. Matt Duffy is expected up to six weeks with back and hamstring concerns, while Joey Wendle left the ballgame in the sixth inning on Sunday with a left hamstring strain. Following the ballgame, Wendle headed for an MRI exam, which showed an injury that required at least a 10 day stint on the IL. To take his place on the active roster, the Rays recalled infielder Christian Arroyo from Triple-A Durham. As Marc Topkin (Tampa Bay Times) noted, the loss of Wendle will impact the lineup against right-handed pitching. 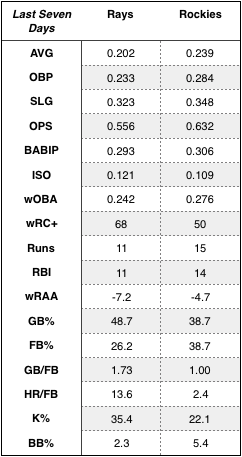 Losing Wendle impacts the Rays lineup against right-handed pitchers as he gave them a lefty hitting option at second base, shortstop or third base. While Arroyo has the versatility to play all three positions, he is a right-handed hitter. Ryne Stanek will open the game on Monday. The right-hander opened 29 games for Tampa Bay last season, and tossed two scoreless innings in his first relief appearance on Saturday. Ryan Yarbrough has not been named as the official bulk innings guy for the series opener, however, since Yonny Chirinos threw seven innings on Sunday, and Jalen Beeks hurled 3-2/3 innings over the course of the weekend, it stands to reason that both likely won’t offer long relief on Monday. We all know what to expect out of Yarbrough by now, an 88 mph four-seam fastball that he moves around the zone — which also has heavy sinking action — an 85 mph cutter with strong cutting action, and a whiffy 82 mph changeup with arm-side fade. He also throw a 75 mph swing-and-miss slider that sweeps across the zone from time to time. Chad Bettis had a recurring blister on his right middle finger which forced him to finish last season in the bullpen. He also most recently was listed as day-to-day coming out of Spring Training. 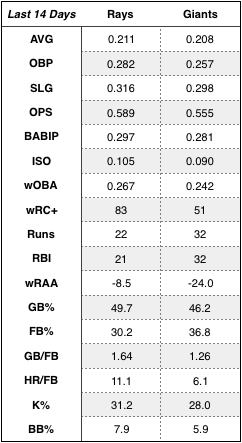 Nevertheless, the Rockies have a solid hurler when he is healthy. For example, last April Bettis went 3-1 and sported a 2.43 ERA. 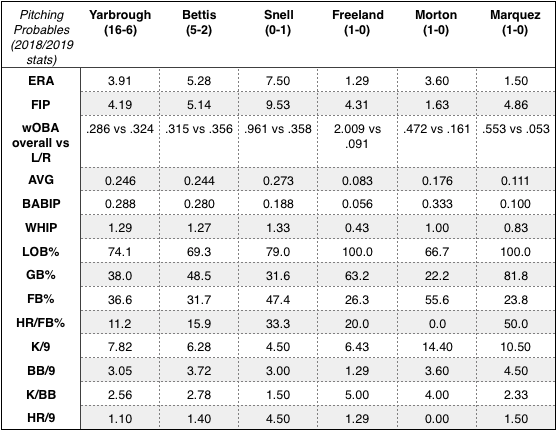 Bettis relies primarily on his 92 mph four-seam fastball that has heavy sinking action and a firm 87 mph changeup, while also mixing in a whiffy 88 mph slider (yet with little movement) and a 75 mph curveball with sharp downward bite. Charlie Morton took the mound against his former team who he most recently played with for the past two seasons. 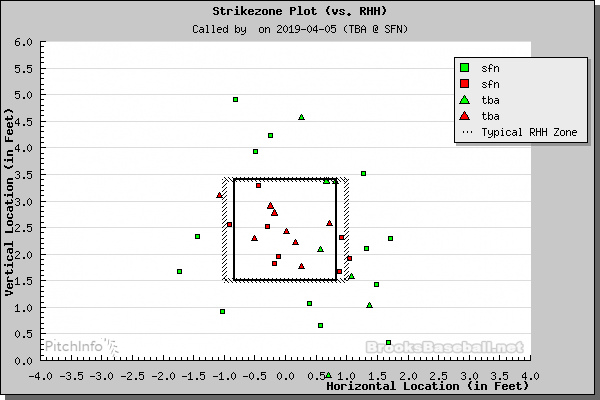 The right-hander was amped up, hitting 97.9 mph on his fastball when he fanned George Springer for his first punch out of the season, setting the tone for the night. However, a three-run rally put Morton on the winning side of the ledger. All told, the right-hander went on to retire six of the last seven batters he faced — a series that began by fanning Yuli Gurriel, marking his 1,000th career strikeout. 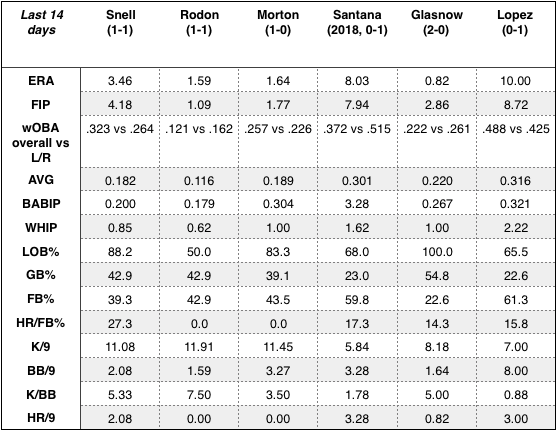 Morton relied heavily on his curveball — 34 thrown, 20 strikes 59% strike rate, 6 whiffs, 30% SwStr — with which he collected seven of his eight strikeouts. German Marquez held Miami to two hits in six innings and fanned seven. His curveball (17 thrown, 9 strikes, 7 whiffs) and slider (22 thrown, 14 strikes, 12 whiffs) were especially effective. Marquez relies primarily on his 96 mph worm-killer of a four-seam fastball and a whiffy 86 mph slider, while also mixing in a hard 84 mph 12-6 curveball and a 95 mph sinker with sharp arm-side run.